Francisco Rodriguez and Ryan Braun both enjoyed their sixth trip to the All Star Game held at Great American Ballpark in Cincinnati. K-Rod was the first to get into the game, relieving Jacob deGrom in the seventh inning. It was a rocky inning for K-Rod as he gave up 2 runs on a walk, hit, and sacrifice fly. Braun had better luck pinch hitting in the bottom of the ninth with the National League down by a score of 6-2. He led off the inning with a triple and scored on a sacrifice fly. The NL squad was unable to score after that and the American League won by a score of 6-3. The Brewers came out of the All Star break with a victory over the Pirates behind a solid pitching performance from Mike Fiers at Miller Park on Friday. Fiers went 7 innings, giving up just 1 run on 3 hits while striking out 7. Gerardo Parra went 2 for 5 with an RBI and run scored. K-Rod brushed off his All Star woes as he pitched a perfect 9th inning for his 20th save this season in the Brewers’ 4-1 victory. 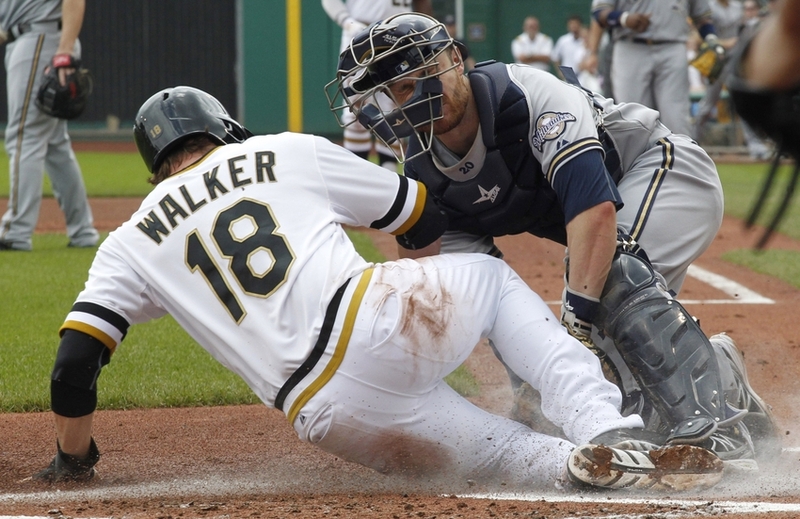 The Brewers used key hits and home runs to back Jimmy Nelson in game 2 of the series. Nelson helped his own cause after a rough first inning with a 2 out, 2 run single in the bottom of the second to bring the score to 3-2. Jonathan Lucroy broke a 3-3 tie in the fourth inning with a 2-run home run. Aramis Ramirez and Khris Davis added solo home runs and K-Rod converted his 21st save as the Brewers held on to win, 8-5. The final game of the series was a pitcher’s duel for 7 innings. Jeff Locke held the Brewers scoreless through 6 innings and the Pirates led 1-0 going in to the 7th when Davis hit a 2 run double to give the Brewers the lead. Adam Lind and Ramirez each drove in a run in the 8th before Shane Peterson put the game out of reach with a 2-run pinch hit double. Taylor Jungmann continued to impress with a 7 inning outing in which he only gave up 1 run. The final score was 6-1. Wily Peralta started another rehab assignment on Thursday, this time for the Biloxi Shuckers. He pitched 3.2 shutout innings, giving up 2 hits and a walk, while striking out 3. He threw 58 pitches.